In her installations, films and videos, Imogen Stidworthy focuses on aspects of communication. She looks at how language occupies public and private spaces, and uses it in her work as a sculptural material to explore relationships between body, voice and subject. She is interested in how meaning is produced between people, often focusing on people or situations where language is not a given – when something disturbs the connection between a thought and a word, or between one person and another. Imogen Stidworthy has taken part in numerous international exhibitions. She is currently showing a major new installation at Documenta 12, Kassel and most recently her work has been shown at eg. 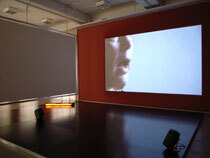 Thessaloniki Biennale (2007), Shanghai Biennale (2006), “Be What You Want but Stay Where You Are” at Witte de With, Rotterdam (2005) and ‘Governmentality’ at Miami Art Central (2004). Recent solo shows include ‘Get Here’ at Galerie Hohenlohe, Vienna (2006), “Dummy” at FRAC Bourgogne, Dijon (2005) and ‘Audio Cab’, a temporary public art work installed in taxi cabs in Luton (2005). In 2004, Stidworthy was shortlisted for Beck’s Futures (London) and in 1996 she won the Dutch Prix de Rome. Stidworthy is a tutor at Piet Zwart Akademie, Rotterdam and an Advising Researcher at the Jan van Eyck Akademie, Maastricht. She is based in Liverpool.